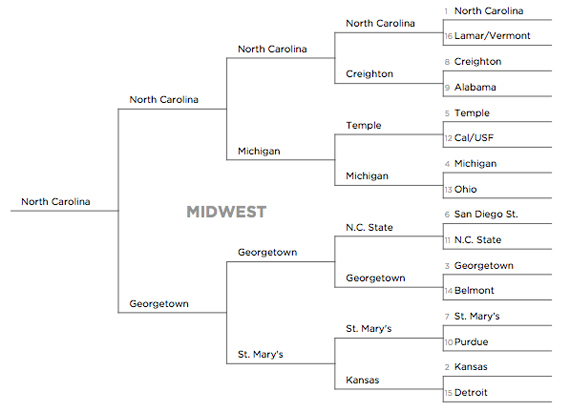 Big League Clu predicts the NCAA Tournament Midwestern bracket! Get your pens and papers out and start taking some serious notes. Before one of these two teams play UNC, Lamar and Vermont must do battle in the play in game as one of the “first four” in Dayton Ohio. I see Vermont winning this matchup. But now lets talk about North Carolina shall we? In terms of raw talent, North Carolina boasts a starting five that could turn out to be one of the tournaments best squads. With household names like Harrison Barnes, Tyler Zeller, John Henson, Kendall Marshall and Reggie Bullock… they’re scary, I expect many good things from this team, and more than likely will see them in the Final Four. Creighton happens to be one of the most effective scoring teams in the country. They were incredibly accurate at shooting from beyond the arc in the conference tourament, hitting 42.5% of their threes. Their one downside is that they have a relatively weak defense, and in a worst case scenario, a bad night of shooting could cost them a run in the tournament. On the other hand, Alabama is are still trying to find its rythm as it heads into the tournament. They did end the season on a positive note, with a five-game winning streak. But, with so much distress going on with their players regarding NCAA violations, it will be interesting to see if ‘Bama can match up against this shooting attack of Creighton. Again we have a play in Game between California and Southern Florida (another “first four” matchup), which will take place in Dayton with the winner playing Temple. In this matchup I see South Florida taking the first game before they have to face the Owls of The Atlantic-10 conference. Speaking of Temple, the regular season champs in the A-10 are in the tournament for the fifth year in a row. These owls are primed to bring the pain and they know how to shoot from long range (seems to be the trend with these mid-major schools). Temple is one of the best three-point shooting teams in the tournament, and over the course of the season they have shot 40.2% from long-range. They are limited due to their size and depth, so if they do get challenged by a team with some big men you could see these owls prepping for their move back to the big east sooner than expected. Here we have an example of polar opposites yet again as we look at Michigan and Ohio. Michigan lives or dies by shooting threes, while the Bobcats rely on a strong D, and only occasional outside shooting. For those of you who think this will be a cakewalk for Michigan, you might be surprised at how interesting this matchup ends up being. Ohio has some solid rebounders and Michigan lacks the size up front, but if the Wolverines are hot from behind the arc, then there shouldn’t be much of a game to talk about here. This Aztecs team is a completely different squad from what we saw in last year’s sweet 16. The main reason this team was able to keep rolling off of last season’s success is the play of Jamaal Franklin (SDST’s leading scorer and rebounder) and shooting guard Chase Tapley. Their main issue, however, is a weak non-conference schedule that ranked 260th in non-conference strength of schedule. This means that this team is not prepared for a high-level competitor. For me personally, this was one of the main reasons why I felt SDST was so overrated last year, and it continued again this year. NC State has been rolling of late, winning five of their final six games of the regular season, and brining UNC to the brink of elimination in the ACC tournament. If it wasnt for a bad call, we might have had a different ACC champion. The Wolfpack’s defense leaves a lot of questions to be answered (78th in the nation), but they certainly pack a punch on the offensive side of things. If you really look at this Belmont team on paper, they are probably one of the most underrated teams in the tournament. They ranked fifth in the nation in field goal percentage, which always something to look at, and hey they team were even picked to win the Atlantic Sun Conference in the preseason. However, they have not met the most underrated team in the lower seeds, aka Georgetown. On what many people considered to be a “down season” for the Hoyas, Coach John Thompson III has done a fantastic job this season by getting some big wins early in the year (against Kansas in the Maui invitational) and solid play in the Big East (12-6 conference record). They were overachievers for sure. With players like Jason Clark and Hollis Thompson, a dangerous duo capable of taking over games from three point range, and some solid work on the boards, clearly these Hoyas do bite back. 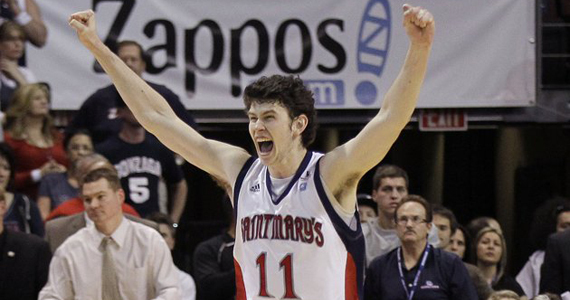 St. Mary’s, the West Coast Conference regular season and tourney champs are one of the best teams most people haven’t seen (except for me of course). If you dont know about these Gaels, you should do a little research so that you can look like a smarty pants at your job come monday morning. You would see that SMC had a nice run to the sweet 16 last year, and are easily capable of making another run this year. Purdue is having its best season in recent memory, and appear to be rolling into the tournament. They won five of their final seven regular season games, in large part due to fifth year senior Robbie Hummel, who seems like he started watching Jeremey Lin tapes, because it has rubbed off on his ability. He has scored over 24 points and gathered 7 rebounds at least four times in each of those last 7 games. Kansas enters the tournament with a little bit of swagger. They do, after all, have Thomas Robinson, who happens to be a National Player of the Year favorite, and big man Jeff Withey. These two have combined to average. 27 points, and 18 rebounds per game….scary! Now with Butler not participating in the tournament this year after making it all the way to the finals the last two seasons, the Horizon league is represented by the Detroit Titans. Believe me when i tell you that the Titans are a big time threat. They like to show off their offensive brawn, boasting four double-digit scorers. They did have a fair share of losses this season, but some of those came in tough contests against Norte Dame, Alabama and Mississippi State. Prediction: When in doubt…I root big east, Hoyas! Prediction: St. Marys will be singin how sweet it is, back to the sweet 16!! It’s ok, most places let you change your brackets before the games start. Go do it now.